Mark Buehrle is just one free agent the Marlins will try to reel in this offseason. Obviously we will spend time talking about how the Marlins did in 2011, but unlike most reviews, it’s all about looking forward for this team. For starters, coinciding with their move (finally!) to a new stadium in 2012, the Florida Marlins will henceforth be known as the Miami Marlins, a rebranding exercise that naturally involves a new logo and new uniforms. Okay, whatever. I can live with that. The new stadium has a retractable roof, which will finally alleviate the long-standing battle with rain in Southern Florida that this team has faced for years. It’s a problem that has resulted in fans saying “no thanks” to tickets. In each of the last seven seasons, Florida has been dead last in the NL in attendance. But to underscore that this is a new era, this traditionally tight-wad team is determined – at least on paper – to make a serious splash this winter. To wit, the Fish (we can still can them that, right?) have made offers to free agents Albert Pujols, Jose Reyes and Mark Buehrle. The team is also taking a look at Cuban outfield prospect Yoennis Cespedes. Owner Jeffrey Loria is going to open up his wallet? Really? It’s true. 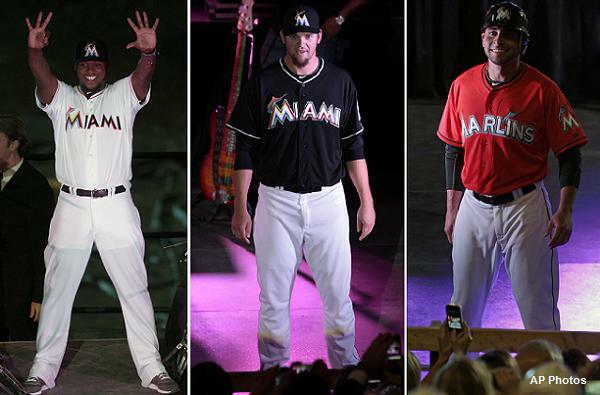 The Marlins are likely headed for their highest payroll ever in 2012. It’s a great plan to help generate major interest and convert the area into a true baseball market that can not only survive but thrive for years to come. Landing even one of these targets would be huge – especially if it’s Pujols or to a lesser extent, Reyes. Finally, the Fish will now be managed by the fiery Ozzie Guillen, a move that some were predicting way before 2011 even started. Now let’s take a step back and see where this team stands currently. There’s no doubt the Marlins need to shake things up to stop the bleeding. They haven’t made the playoffs since 2003, when they won their second World Series (in, strangely enough, just their second playoff appearance). In 2009, the Fish were right in the Wild Card race, but fell short with 87 wins. They slipped under .500 last year with just 80 wins and then plummeted to just 72 this season, finishing in the cellar of the NL East for the first time since 2007. The thing is, Florida actually jumped out to a big start and were sitting at a robust 18-9 in early May. The Marlins held their own in May and then the collapse started in earnest in June. A stretch with just 14 wins in 46 games left the team nine games under .500 in late-June and they never threatened again. For the rest of the season, inconsistency was thy name, Florida. After that nice April and decent May, the Fish went 5-23 in June, rebounded for a big 17-10 July, before crashing again in August (7-20) and, to a lesser extent, September (12-15). As long as they are in the NL East, the Marlins will need to find a way to be better against the Phillies and Braves. They dropped 24 of 36 against this pair this season. Remove those two teams from the equation and Florida was flirting with a .500 record against everyone else. But such is life with the unbalanced schedule. The offense was weak, finishing near the bottom in the majors in runs, BA and steals. They struck out more than most teams, but also walked more than most. A contact team the Marlins were not. The pitching was marginally better, but hardly good, except for their bullpen which ranked seventh in ERA and saved the overall team mark from being awful. The staff did rank ninth in strikeouts and was also in the top ten in K/BB ratio, but the rotation was near the bottom in quality starts, putting plenty of pressure on the pen to bail them out. On the plus side, Florida did a great job of picking it, ranking in the top 10 in both fielding percentage and fewest errors committed. Let’s break down the team as currently comprised. In the rotation, injury prone ace Josh Johnson will be back, and that will provide a huge kick in the pants to this team. It would provide an even bigger boost if he can somehow make 30 starts or more. Venezuelan righty Anibal Sanchez enjoyed his first 200-strikeout season, but a tough July and August doomed him from having a career year. Ricky Nolasco improved his homer rates, but was way more hittable. He’s managed to reach double digits in wins in each of the last four seasons, but isn’t really progressing. Chris Volstad is also spinning his wheels, developmentally. He showed some progress last year but only won five freaking games all season this year. Mind you, his command was much better this year, so perhaps there’s hope. He also teased us with his performance down the stretch: over his last seven starts, Volstad went 0-3, but only gave up 40 hits and 14 runs (13 earned) with three homers in 42 1/3 IP. He struck out 29, walked 12 and enjoyed a 2.76 ERA over the final five weeks. Consistency has never been his strong suit, but more of that Volstad will be a real asset (assuming the team doesn’t non-tender him). Javier Vazquez, the No. 2 starter, is a free agent, and it’s doubtful he’ll return to the Marlins – assuming he wants to continue pitching at all. If he’s done, it was a sweet comeback effort as he was phenomenal in the second half (2.15 ERA, including a club-record 29-inning scoreless streak in September). In mid-June, this dude’s ERA was 7.09 – the worst mark in the bigs, but Vazquez gave up just three runs over his last six starts. Yikes. Both Brad Hand and Clay Hensley got extended looks in the rotation, but neither proved capable of holding down a spot. If Buehrle is added, that would really help round out this rotation, which will already be much better just by getting Johnson back. And a durable lefty like Buehrle will help offset the loss of Vazquez. In the bullpen, lefty Mike Dunn emerged as the team’s top left-handed set-up man and he did a better job of limiting baserunners. Acquired from the Braves in the Dan Uggla trade, Dunn is nasty against lefties, but still too vulnerable against right-handed hitting to move up the pecking order. Edward Mujica, also added through a trade last offseason (from San Diego in the Cameron Maybin deal), emerged as the team’s top set-up man. His command wasn’t crazy good like it was in 2010, but was still off the charts. And then there is closer Leo Nunez, who is now known as Juan Carlos Oviedo after it was discovered he used fake documents to sign a contract. He was placed on the restricted list by MLB near the end of the season and was deported. The visa issues are still unresolved, so his future is very much up in the air, but Miami plans to wait this out with the hopes of having him return as the closer next year. That move could backfire, but we’ll know more as the winter progresses. Before he was dispatched, Nunez/Oviedo improved his hit rates, but his strikeout rate plummeted. He’s far from a lights out closer, but the Marlins will likely be paying him like he is after arbitration this winter. Lefty Randy Choate was performing extraordinarily well as a LOOGY before an elbow injury shut him down six weeks early. He’s expected to be ready for Spring Training. On offense, outfielder Logan Morrison had an up and down season – literally. Part of the team’s great rookie class of 2010, Morrison surprised many with his power spike, but had to be farmed out for a while – ostensibly because of his performance, but really the demotion had more to do with his off the field behaviour. He’s certainly not afraid to speak his mind, and while that’s a good thing, he’ll need to learn to rein that in a bit if he’s going to get the chance to be the star we all think he’s capable of becoming. Another young outfielder, Bryan Peterson had a huge season at Triple-A and while he wasn’t overly productive in his rookie season in Florida, he did enough to put himself in the mix for the centre field job next year. After Chris Coghlan hurt his knee and never resurfaced, Peterson got his shot, but I’m not sure how comfortable the Marlins are with either of them going forward. First baseman Gaby Sanchez had a season remarkably in line with his rookie effort in 2010. In other words, there was virtually no progress, and while he’s got decent extra-base pop, there’s just not much upside here. Of course, if Miami somehow lands Pujols (which is highly doubtful), Sanchez will lose his job. If the Marlins truly believed Sanchez was a long-term answer, they wouldn’t be looking at Pujols, would they? That boatload of money would be better spent at another position or on concentrating on improving the pitching staff. Second baseman Omar Infante, not surprisingly, was unable to duplicate his big 2010 season in his first year in Florida. As a full-time player, he set a new career high in hits, but his run total plummeted and he had his worst OBP since his last year in Detroit. Still, the Fish must have liked something about his light-hitting ways as it gave him a two-year, $8-million extension just before the end of the season. Back in the outfield, sophomore Mike Stanton took another step towards superstardom. He turned 22 earlier this week and is just starting to scratch the surface of his power potential, which is scary news for NL pitchers. I love the fact that he’s become more patient as well. Stanton spent most of his time batting sixth this year, but I’d be surprised if he’s not the full-time clean-up hitter in 2012. There’s a 50-homer season in his bat, and it’s coming soon. Super sub Emilio Bonifacio got to take over shortstop when Hanley Ramirez was lost for the season and he enjoyed a career year. Seeing his most action yet, Bonifacio responded more extra-base sock than ever (not that he’ll suddenly be confused as a slugger, mind you), but more importantly 40 steals and a near .300 average for a team that was in desperate need of both. He also showed more patience than ever before, establishing himself as a bona fide leadoff man. If Miami does sign Reyes, Bonifacio could shift to centre field to fix that issue. Either way, the Marlins will find ways to get him in the lineup and the fact that he’ll qualify at outfield, third base and shortstop next year makes Bonifacio a real Fantasy asset. Third base prospect Matt Dominguez had a solid year at Triple-A, showing developing power potential, and more or less held his own in his first taste of the majors. The jury is still out on how much of a hitter he’ll be, but his immediate future very much hinges on whether Reyes is signed. If so, Ramirez will shift over to third base and Dominguez will spent another year in the minors (unless he’s peddled elsewhere, of course). Stokes was plucked out of a Texas high school at the tender age of 18 with power potential splashed all over him. The Marlins opened their wallets for the first-round talent, penning him to a $2.027-million signing bonus. So far, they haven’t exactly gotten much of a return on their investment as injuries have derailed the 6’4”, 225-pound behemoth from advancing beyond Triple-A.